Flatter Files has been updated today with a significant overhaul to the application to provide a significant increase in performance. This increase in performance should be noticeable by everyone although customers with large quantities of drawings or documents will likely notice it the most. In addition to the performance boost, Flatter Files now contains the ability to create custom libraries. By default your account contains both a Drawing and Document library. Now you can add as many additional libraries as you need to help organize your content. All libraries can easily be renamed as needed and you can also delete any of your custom libraries. 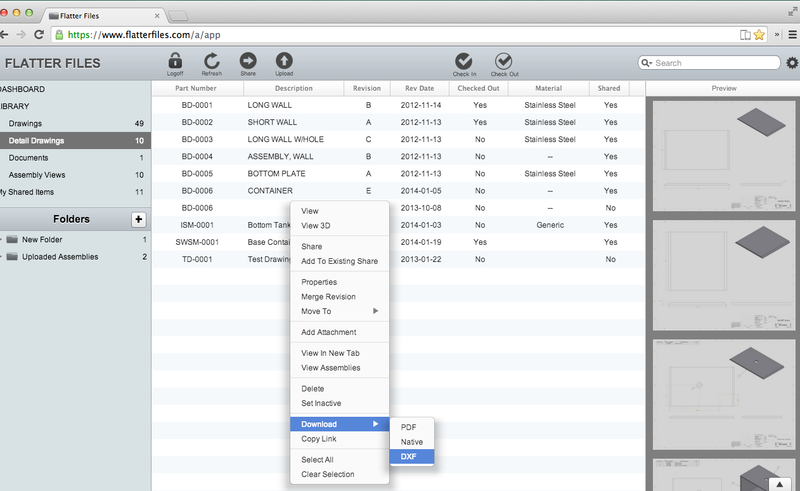 Simply right click on an existing library to display a menu of the library options. You can also easily move items from one library to another. Simply right click on the item you want to move and then navigate to the "Move To" option. This is shown in the image below. The uploader application has also been updated to support uploading directly into any of your libraries. The iOS mobile applications will be updated in the near future. For the time being, all items even if they are in a different library will still be shown in either the drawing or document library when accessing your content on either your iPhone or iPad. The uploader application has been updated with a couple of new options. 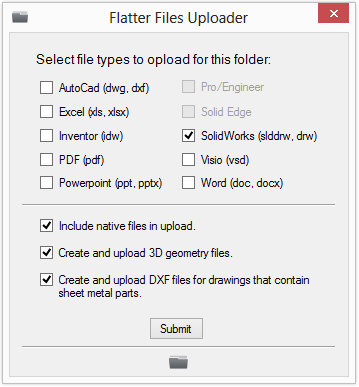 Anytime the SolidWorks or Inventor file type is selected then the DXF creation option will appear such that you can determine whether the DXF files should be uploaded. In addition, you can now turn off the uploading of the actual native files for each item and you can turn off the uploading of the 3D geometry files. By turning the 3D geometry option off you will no longer be able to view a 3D view from within Flatter Files. These new options allow you to further customize the uploader's operation such that it fits your needs. For example, if including the native files is not important to you then by turning off this option each upload will take less time. Flatter Files contains a simple revision control and notification system for keeping track of you content. This revision control system makes it incredibly easy for everyone in the organization to be able to view the latest revision at any time as well as being able to view previous revisions when needed. Flatter Files significantly reduces the potential of an incorrect revision being used. Some companies need more advanced revision controls especially as related to the managing of a workflow within a CAD department than what Flatter Files offers. A popular software product that provides such a capability is SolidWorks Enterprise Product Data Management (EPDM). Flatter Files is now integrated with EPDM such that you can get the best of both worlds. 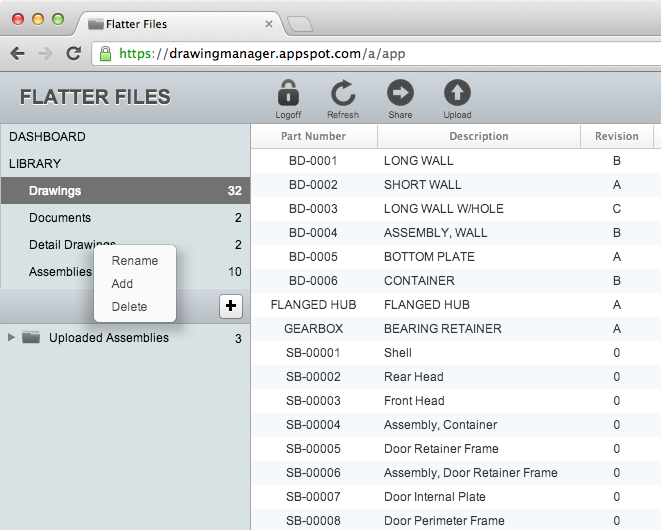 Flatter Files integration with EPDM is extremely simple to use. First, install the Flatter Files Uploader onto a computer that has access to the EPDM Vault. 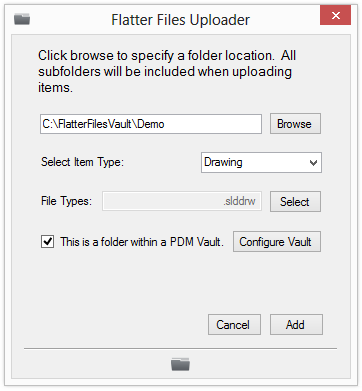 The Flatter Files Uploader is configured in the same manner as before by configuring a folder to upload. The folder should be within EPMD Vault. There is now an additional setting for when using the EPDM integration as shown below. 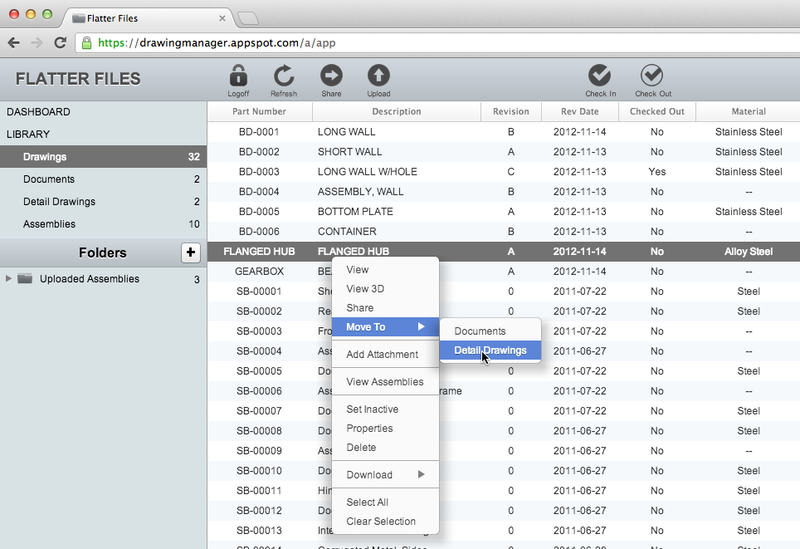 As you can see, check the box for the option "This is a folder within a PDM Vault." Then click "Configure Vault." This will display the following screen for configuring the access to your vault. Currently, "SolidWorks EPDM" is the only available PDM solution integrated with Flatter Files. Therefore, it is already selected. The next item is the name of your vault. Enter the appropriate name. The last item is the final state of your workflow. When an item reaches this point in the workflow it is considered complete and will be uploaded to Flatter Files. Once the appropriate items have been entered click "Submit." This will return you to the main folder configuration screen. By clicking "Add" the folder configuration is complete. Now that the folder is configured for use with EPDM, you are ready to begin uploading your content to Flatter Files. This works in the same manner as before except files aren't uploaded unless a new revision has been created from within EPDM. In addition, once the file is uploaded it is automatically checked in and immediately available for viewing. Whenever a file is checked out it will also appear on Flatter Files as checked out such that if anyone views the file it will notify them that it is currently checked out. The result is that all of your content is available for viewing from within Flatter Files but all of your revision control occurs entirely from within EPDM. If you are currently an EPDM user then it is likely that you already have many revisions for many of your drawings. Flatter Files will automatically upload all of the revisions that currently exist such that all of your existing content is available. 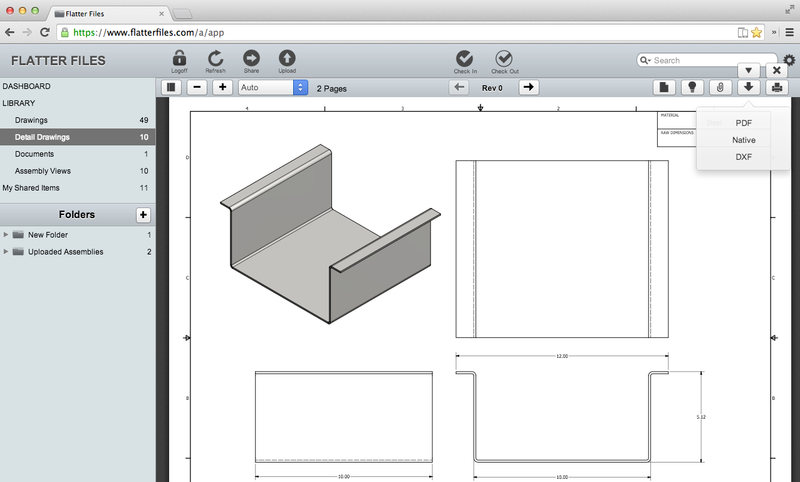 Flatter Files is now in the Autodesk Exchange Apps Store. By downloading from the store, a button is created in both AutoCAD and Inventor that will launch the Flatter Files Uploader application. This button simply works just like a desktop shortcut to the Uploader application except it is built directly into AutoCAD and Inventor for quick and easy access. In addition, if you click this button and the Uploader application is not installed on the computer, then the Uploader application will automatically be downloaded and you will be prompted to install it. To download from the Autodesk Exchange Apps Store please click the appropriate link below. If you use both AutoCAD and Inventor you must install it for each independently. Once the AutoCAD version is installed, you will find the new button located in the Plug-ins tab. To launch the application simply click the button or type the command FLATTERFILES. Once the Inventor version is installed, you will find the new button located in the Tools tab.